Along with the classical call-response mechanism in music, Acanthrophis also employ something which I liken to a relay dynamic. Call-response at the intra-riff level would imply that the first phrase would end on a tentative, open-ended, unresolved note; the second phrase would then commence in the vicinity of the same note of tension, and strive to arrive back at the root of the motif, thus achieving a neat, tied-up, mirror effect. This is the way of almost all traditional heavy metal, and even a lot of underground extreme metal, a method that cleaves musical conflict, and makes for accessible consumption, at least at strategic points in the song. Acanthrophis make use of this to a nicety; this use, coupled with the melodically aware nature of their music and a lack of aversion to slowing down to 4/4 tempos, makes obvious their connections to an old heavy metal composing ethic. Alongside the call-response, however, is also placed the relay alluded to earlier; it is a participatory mode of sorts, where secondary voices regularly break in on the primary, either to enhance the latter’s appeal, or to express their dissent. An abstract and idealized house of parliament where different personalities, at times, clash, at others lend each other their support, all to work towards the common weal: the song, in Acanthrophis‘ case. 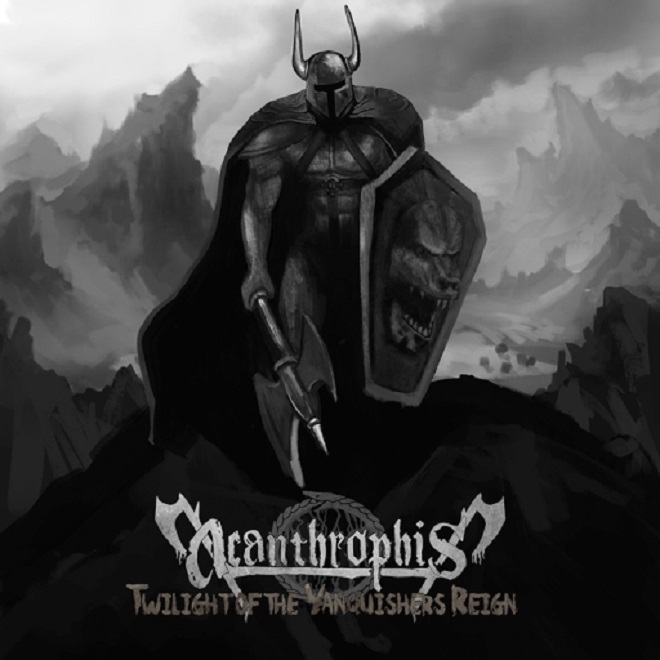 Twilight of the Vanquisher’s Reign is busy and technically accomplished music but at no point does it feel cacophonous to an ear bent on following its threads or a mind sufficiently attuned to its objectives. There is unabashed emotion here, but not at the cost of a certain musical common sense. Acanthrophis are after an accumulation and a distillation of metal as musical tradition; a worthy endeavour and a most promising start, but it is only when one begins to understand the sheer breadth of what that tradition encompasses, in technique, yes, but also in other less expressible ways, that one can hope to approach an album like Twilight of the Vanquisher’s Reign with the requisite empathy and solicitude. This entry was posted in Black Metal, Death Metal, Heavy Metal and tagged Acanthrophis, Twilight of the vanquisher's reign. Bookmark the permalink. Thank you very much for the positive review and for hearing what I was trying to get across.